Yesterday Michael and I went up to Chicago to visit our new-found and long-dead friend James Tissot, and to hear a concert played by Jack DeJohnette, Muhal Richard Abrams, Larry Gray, Roscoe Mitchell and Henry Threadgill in Millennium Park, that was part of the Chicago Jazz Festival. The concert had its high points, since all the musicians have an overabundance of musical imagination, and its low points, because sometimes when jazz musicians improvise using minimalist repetition as a starting point, the repetition can become, well, repetitive. I was most impressed with Larry Gray, an exceptional Chicago-based bassist and cellist, who I heard last night for the first time. I was also found Jack DeJohnette's inventive use of percussion sounds really stimulating. There was one point when he used a microphone to capture the pitches of a few suspended cymbals. Roscoe Mitchell, who is an extremely impressive saxophone player, came with a battery of wind instruments, including a bass recorder and, of all things, a modern-pitched baroque flute. Henry Threadgill supplemented his impressive saxophone playing with a bass flute. I appreciate the use of those instruments, but I was not impressed with the results. The concert had items of visual interest, and because our visual imaginations were stimulated by Mr. Tissot's work (across the street, literally), my eyes were quite open. This was my first time in the interesting-to-look-at Geary-designed Jay Pritzker Pavillion, and the first time I have ever been to a concert where I could see the musicians in real life and on a huge video screen at the same time. I'm not sure if it was my imagination, but I think that I could even hear some of the music coming out of the instruments themselves. But the huge array of speakers took care of most of what I heard. The huge video and audio presence made me feel less like I was at a concert and more like I was watching a broadcast of a concert. It was a strange feeling. I did not like the fact that my attention went to the illuminated shiny object hanging above the actual musicians. I enjoyed the fact that there was a very large and attentive crowd at the concert (a rare experience for me). Many audience members followed the traditional jazz protocol of clapping at the ends of solos, but since the length and structure of solos did not have the usual points of reference that jazz musicians use (there was a lot of free improvisation), it seemed as if solos ended when people in the audience decided to clap. It was odd, and sometimes annoying, particularly when one of Larry Gray's really interesting solos was cut short by someone in the audience who felt like letting him know (in a very loud way) that he liked it. I also noticed an odd phenomenon. Much of the music was not metric: DeJohnette was certainly playing rhythmically, but his rhythms were not regular and did not fit into the standard duple-type meter people bob their heads to when listening to jazz. I noticed a bunch of head bobbing in the crowd, but the regular motion (i.e. the "beat") was different for different people. You could say that everyone was dancing to a different drummer, which seems appropriate for a five-person collective free improvisations. After the concert we had coffee with a fascinating person Michael knows from the blogosphere, which was great fun. Michael made a post this morning noting five things about The Butler, and challenged me to write a post of my own with a list of my own observations. Since one of his observations is actually something I thought of first (he does credit me in his post), I'll begin with that one. The character of Louis Gains (the Butler's fictitious older son), and David Oyelowo's portrayal of him is clearly modeled on congressman John Lewis. When I looked it up I found that the striking resemblance was clearly not my imagination. It allowed me to embrace the film as a work of informed fiction rather than as documentary. The radical Angela Davis hairstyle and loop earrings that the character of Gina wore as a Black Panther in the 1960s made its way into the character of Gloria's "hip" wardrobe in the 1970s. 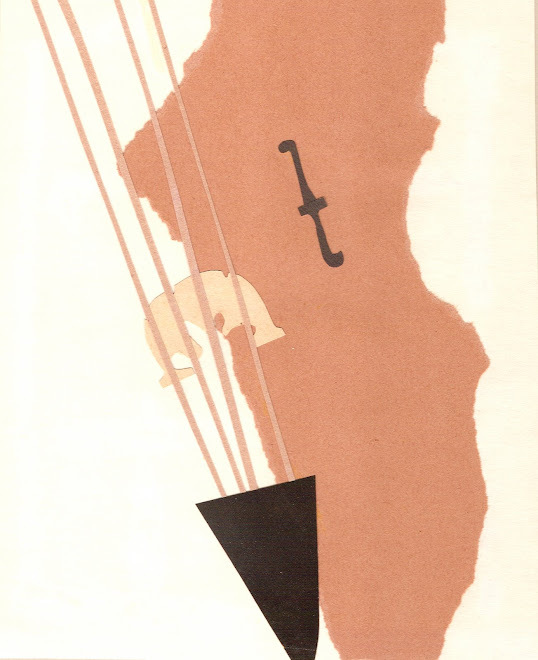 It was wonderful to see Pablo Casals' White House Concert woven into the narrative (very smart music direction by Rodrigo Leão), but I was disappointed to see that the cellist looked nothing like Pablo Casals, and that the actor, who was a real cellist, wasn't credited. None of the iconic presidential or first lady figures looked physically or facially like the people they were portraying (with the exception of the girl who played Caroline Kennedy), but the costumes and acting did enough to suspend disbelief. I appreciated the solitary quality that surrounded all of the presidents, and I feel that the film demonstrated in a quiet way the weight of responsibility that they all felt. Making reference to important events, demonstrations, famous people, and tragic events can be heavy handed in semi-historical fiction. I thought that the film handled that delicate balance extremely well.
. . . and one more from me (to copy Michael): Our showing of the movie in our mini-multiplex (mini by city standards) was in the large stadium-style theater. We had our choice of seats because aside from another couple (who sat in the back), we were the only people in the theater. I'm responding to the discussions I have been reading around the internets concerning judging competition winners by the way the finalists look. Everything seems to be based on this study. I learned the hard way (during my periods of relatively unattractive adolescence and young adulthood), that looks really matter when you are trying to have people take you seriously as a musician. I was relatively clueless, and I had the clothes to prove it. My teacher, Julius Baker, even told me that I needed to do something to improve the way I looked, but I was simply not equipped to respond properly. To put it bluntly, I would have been an excellent candidate for What Not to Wear. Being a female flutist didn't help matters. I was surrounded by attractive young men and young women who knew how to dress. I knew how to practice, I knew how to grow myself intellectually and musically, and I knew how to make friends, but I did not know how to make my outside reflect the expressive parts of my insides. Being short but not, er, petite, never helped either. Nothing is new here. Everyone who has a working pair of eyes would tell you that how a person looks when s/he is performing makes an impression. You can often tell something about the quality of a string player's sound by the way s/he draws the bow, and you can see personal involvement in any musician's face, as long as they don't have an instrument getting in the way. Consider the faces of oboists at work. Body language tells a lot as well, but body language tells a lot in any field of activity. This study used samples of finalists from major international competitions in which all of the musicians could play their instruments at an extremely high level. 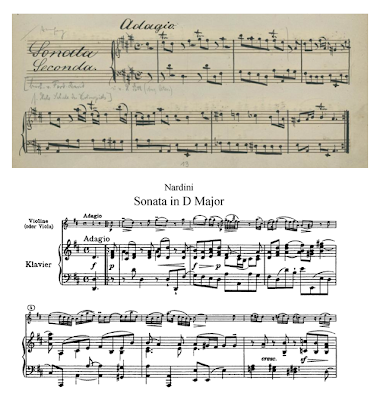 In rare instances someone with a spectacular musical personality and original musicianship makes it into the finals, but more often people get to the final round of a music competition by either playing flawlessly, or make fewer mistakes than the other semi-finalists. A competition is a truly subjective situation that is used by our culture as an objective measure of musicianship. Competition medals then become the currency for musical careers. I doubt that any non-musician presented with a very short audio clip of three stellar musicians playing the same piece on the same instrument could be able to tell you the difference between the playing of each person. I know for certain that the same person could give details about how each person looked if given a video-only clip. 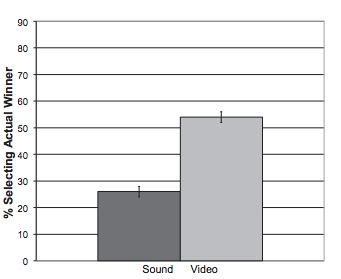 If you can't tell the difference in the sound (and on recordings you really can't), the only basis on which to judge is the visual. Unfortunately many professional musicians would be guilty of the same kind of reaction. I would take this study more seriously if there were controls concerning the piece of music the finalists played. The same piece might give a decent basis for comparison. I would also take it more seriously if the time involved was longer than six seconds, because we are all guilty of spending the first minute of watching any musical performance accustoming ourselves to the visual. It takes time to hear. Also, the results of this study do not show that we can predict competition winners by the way they look, because the actual success rate (i.e. picking the winner) is just above 50%. I'm not able to do the math (you can thank my Juilliard education for that), but it seems to me that when you have three choices, and you choose one, you are bound to be right at least 30% of the time. "Believe me, that's got heart!"
. . . and while we're at it, Jimmy Durante enters this clip (with Jack Benny) at the 3-minute mark. It Happened in Brooklyn is a surreal movie, but when I saw this I really thought I was dreaming. The movie is loaded with Jimmy Durante brilliance as well, and much, much more music. It's a "must see" for musicians. Your Letter,which was the first I had received from any of my Friends in Scotland, proved one of the welcomest I ever got. 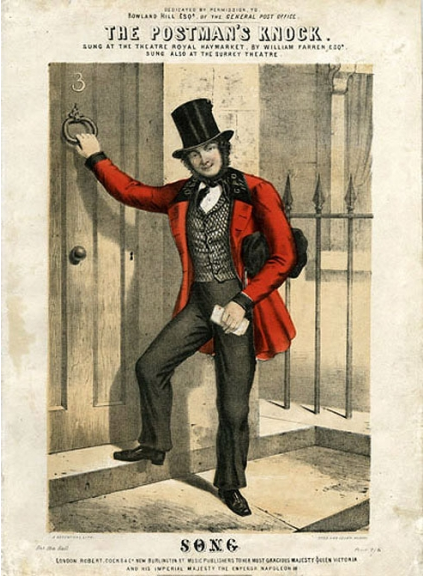 The Postman's two knocks (for all Postmen give two smart thumps, which are known here and elsewhere as the “Postman's Knock”) brought me it and the Newspaper, and delivered me from a multitude of vague imaginations. Somebody hears the postman’s knock. As he hastens from door to door. For high, low, rich or poor. In many a grief he can see. He drops through the hole in the door. At eighteen a letter of love. 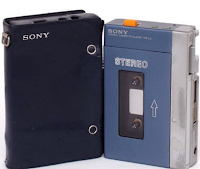 My first memory of the Sony Walkman is from 1981, when I saw a conductor I knew from Salzburg (how I wish I could remember his name, though I remember that he looked a lot like a young Peter Lorre) walking down the Kärntner Straße in Vienna listening to a recording of Lulu on one. He took off his headphones and let me listen. It was astounding. If I had a pair of headphones myself, I could have plugged them into his Walkman and listened with him. 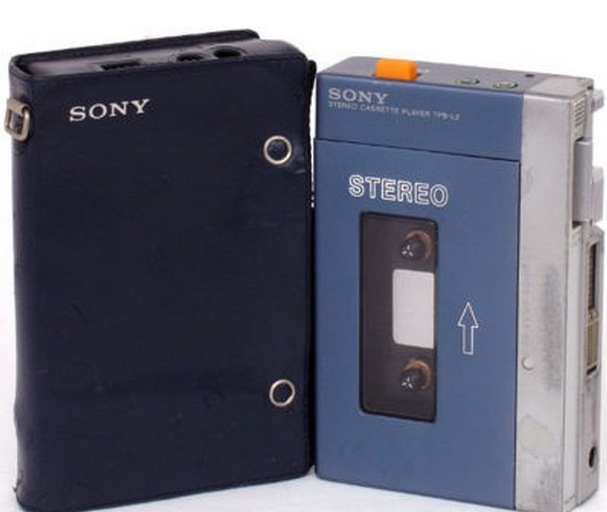 The Walkman was originally designed with two headphone jacks. Listening to recorded music was not generally considered a purely private activity in the early 1980s. 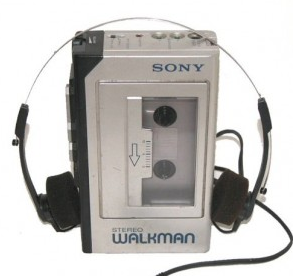 My early 1980s Walkman eventually stopped working, and when I looked for a new one, I found that the company no longer made Walkmen with two headphone jacks, and none of the competitors did either. If I wanted to share my high-quality outdoor mobile listening experience, I had to buy a splitter. This is not as much of a statement about technology as it is about the change in the way we listen to recorded music. Read Annie Murphy Paul's article here. I heard an interview this morning that was part of this episode of The Story. Here's part of what Gore Vidal had to say about things that matter to me a great deal (and things that might matter to you too). You’re born into a society and you are shaped by it whether you know it of not, whether you like it or not. Each of us is born into a prison of received opinion, of superstition, and of prejudices. Now, one of the functions of art is to try and define the prison. A: the artist must know he’s in it, and many of them don’t, and those are the bad artists. They just take it for granted this is the way things are. They don’t know that there are worlds, as Shakespeare said, “there is a world elsewhere.” They don’t see anything past these bars . . . and that to me is . . . Alfred Whitehead said something fascinating about this. He said “you can always determine the nature of any society by the things that it does not write about itself." 'Cause it takes them so much for granted they feel no need to state it, so by the omissions you can determine what a society was like. The prison is going to break you eventually, but you can at least get a look out, and it’s the look out that is art: seeing something that is elsewhere; an alternative to the life that you’re leading. To get to try to see the thing; the whole, that’s what we want, that's why we write. To try and get. . . There is no purpose to life, there is no point to life, other than what you invest with yourself, by your own actions. Or the making of a book, or the making of music, or the making of any creation is to try and hold the moment, to give it certain order, to bring order out of chaos, and for an instant to say “here it is, held, seen whole," even though, of course, it really isn’t. Sometimes I wonder what "being" a composer actually is. When you're not currently writing something, are you still a composer? And when you are working on something that you realize doesn't have any particular value, are you then a lousy composer? How about if you write something that nobody else seems to like? If you stop writing music, are you still a composer? Oh how I envy Haydn! He never had to ask these kinds of questions. 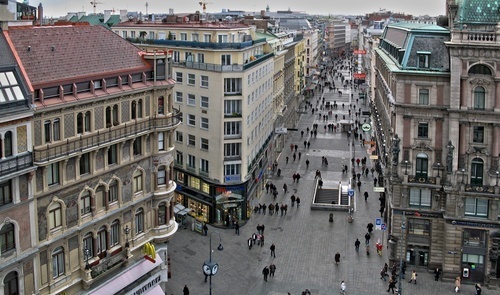 He reported to his Prince and got his musical orders for the day, and after he was dismissed with a generous pension, people in Vienna and London wanted more new music from him. He did have tremendous musical responsibilities, but he also had the ability to meet them with music that was inventive, brilliant, always interesting, always modern, always a pleasure to play, and always meaningful. 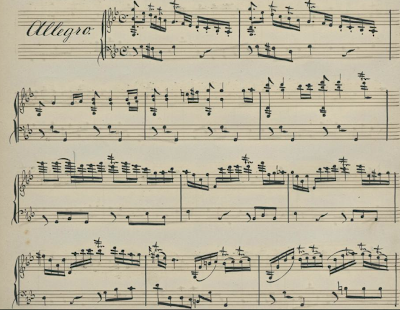 The pleasure I get from his Piano Sonatas offsets nearly any sadness or feeling of isolation that comes into my life. I can't think of a single piece of Haydn that doesn't give me great pleasure. 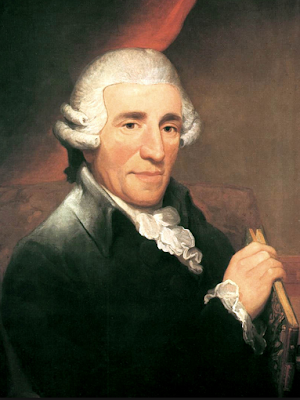 I suppose that Haydn never had to wonder "what" he was in his world. He was simply a musician. I came across a fine piece of writing from Karen Rile that I thought I'd share here. There have only been a few years (maybe seven, with four of them happening before I began school) of my life when I didn't operate on the academic calendar, so I suppose it is appropriate to encapsulate the summer on this last weekday before the fall semester begins. The past 10 summers have been relatively active ones for me musically because there were many weddings to play, and there were lots of students to teach. This summer was quite different: the weddings were sparse, and my students have mostly been away. I am basically a restless soul, and I like to keep myself occupied, so this summer I felt like I was doing relatively little. On second thought, I might have accomplished a lot in spite of my inactivity (or perhaps because of it). I learned some things about efficiency and balance, which I have been able to relate to my tendonitis-prone forearms, and, in addition to doing regular exercises with the very nifty FlexBar, I have been able to practice more mindfully. Michael and I went on two "road trips" to New Jersey, one for pure pleasure, and one for grief. We also had a huge virtual road trip by watching the whole run of Route 66 (here are Michael's posts). I made nine new arrangements to use for weddings (one person commissioned eight of them), wrote three pieces, and had a really successful Summer Strings session in June and July (I'll have recordings from the concert eventually). Michael and I spent a lot of quality time together (some of it in parallel play), and found ways to have adventures in an otherwise-sleepy town. I read some books, wrote some reviews, saw some movies, ate many meals, and slept late sometimes. There were days when I wasn't even sure what day it was. I also learned some things about life as seen through a computer screen, which is where I have spent far too much time this summer. There are some people (friends of friends) you can wave to across a figurative room, and if they are not "important people" (as many of the people I knew back in my previous lives are) they "wave" back. Some people engage in conversations about current events, and some people compliment one another on the way they look. There are also people at the "party" who talk about their shared pasts, and people who talk about their current projects. Some people use the space to share things that they have found of interest on the internet, and some people use the space to promote causes and connect with people they otherwise would never get to connect with. It is quite a lively place, without walls, without time, and without cost, except for the toll that it takes on all the emotions connected with past times, past places, and past failures, both professional and personal. I find myself (once again) not at "home" in such a "place." I find myself far more at "home" in the blogosphere. There is more "buzz" over at Facebook, but I think that there is more substance happening here, wherever "here" is. I inadvertently found myself participating in an experiment of sorts here in the musical quadrant of the blogosphere. I made a short post about the decline in my blog's readership over the past several months, and suggested that more people comment about things people write on Facebook. Several other bloggers with rather high readership linked to my post, and everything was all abuzz for a day or two: I had three times my usual number of visitors for two days, and a few people actually engaged in a bit of commentary (one post had ten comments, though five of them were mine). Now it's back to "normal," which is kind of where I expected it would be. Things observed to be in decline seem to pique people's interests. I wonder why? I really appreciate the people who come here regularly, and I really appreciate the handful of musical bloggers who still post regularly. I have learned from my Facebook experiences that I will never really feel at home among people who just like to stop, graze, and move onto the next shiny object, particularly when I find myself doing exactly the same kind of thing. I'm not deleting my Facebook account this time (it doesn't really delete anyway), because it is a good way to see things that our kids share (our daughter and her fiancé have an adorable cat). If you would like to communicate with me (and I hope you do) please do it by e-mail, by phone, or comment on anything I write here. 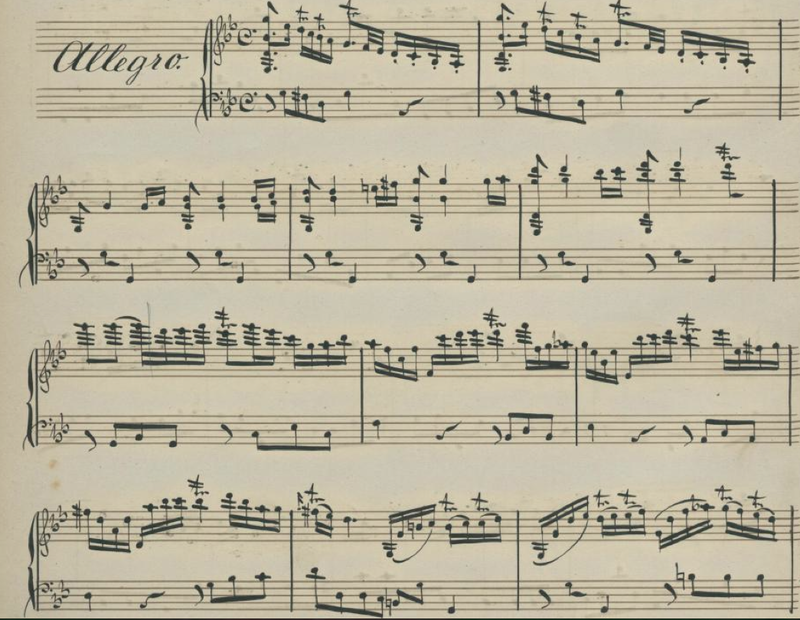 It doesn't seem that long ago that playing Heinrich Wilhelm Ernst's "Last Rose of Summer," the sixth of his Polyphonic Studies, was something rare for a violinist to be able to do, particularly in public. I'm showing my preference for this interpretation by the young and new-on-the-scene Josef Spacek in this post, but you are welcome to weigh in with your thoughts! Here are performances by Hilary Hahn, and Mateja Marinlovic (it's very good, but difficult to listen to because of the recording equipment). Also, for your amusement, here are Gidon Kremer, Midori, Ricci, Julian Sitkovetsky, and for those who like their virtuoso fiddle players really young, the 12-year-old Maxim Vengerov . If you want a look at the music, you can see it here. If you love what I like to think of as "transitional" virtuoso violin music (transitional between the Baroque and Classical periods), and you're a fiddle player, you really should check out Pietro Nardini's 12 Violin Sonatas. This manuscript from Dresden in the IMSLP is identified as a 19th-century manuscript, but I think that it might be from the 18th century for various reasons. First of all, there's the strange use of the G clef on the bottom line of the staff. It functions just like any normally-placed G clef. Also the bass clef is a letter F, and not a C clef, and it functions like any normal bass clef. I believe that by the 19th century these clef-related things were ironed out. The not normal stuff (aside from the really ingenious violin writing) is that when you see a flat sign in a key that has sharps in the key signature, it functions as a natural sign. This took me some time to figure out (and by doing so I've saved you time, oh eager violinist). Now I'll get back to reading some more of these wonderful treasures. Oh yes. That hand-written in the manuscript refers to the inclusion of this piece in Ferdinand David's Hohe Schule des Violinspiels. Perhaps he only had room in it for one of Nardini's Sonatas. I think he could have picked any of them. It is interesting to look at Lisa Hirsch's latest post about her place in the musical blogosphere, and to read Alex Ross's post about his (which mentions my post, and has upped my readership by tens). I have really only glanced at The Rambler since it moved to WordPress a couple of years ago (I thought he just stopped writing), but I think I'll bookmark Tim's page there now. I just left a comment on his most recent post. Perhaps this blog post might stimulate another comment or two there, or perhaps not. I imagine that the answer is "not." My issue is not the number of visits I get, but the general lack of engagement I notice in general. Most of the blogs that I used to read are no longer active. Perhaps people thought of them as a stepping-stone towards more professional writing (as in Soho the Dog), or people have migrated to Facebook, where they can feel good about pressing the "like" button rather than engage in some kind of a discussion. I find that kind of discussion that used to happen in the "interblogs" now happens on "legitimate" commercial sites and newspapers, but most of it isn't about music. Incidentally, most of my visitors of late (199 as of right now) have come to this post from blog posts about the gradual fall of the musical blogosphere (particularly this one). Most of my posts, according to my blogger stats, have 30-60 views. This is by no means anything like the "big time," but I know the "big time" and don't really have much of a desire to be part of it because I like to be able to speak my mind. Once you reach "big time" status, your opinions are owned by others, and it's difficult to be really honest. Perhaps we musical bloggers used to be voices in the wilderness, eager to find other living and breathing souls who understood us in some way. Perhaps that wilderness has become overrun with billboards and neon, traffic noises, and tourists taking pictures. Those of us who used to feel we had a voice and a place to be heard are passed over in favor of a "current" authority. Perhaps this has to do with the prestissimo pace that information comes into our lives. On Facebook new stories become old ones, as quickly as old friends become new ones (and then they fade back into the times of the old friendship--sometimes to "places" we would rather not dwell too long). The worlds we now inhabit through our devices have become kind of like bubbles. They emerge, they rise, we chase them, and sometimes we catch them, but once the bubbles pop they are forgotten. In the end we are all limited human beings who only have so much room in our lives for "stuff," and that includes material stuff as well as intellectual stuff. Why should the internets (in any form) be any different from life in a small town (where hierarchy plays a starring role)? Why should the internets be any different from the schoolyard? Why should the internets be any different from the barnyard? For as long as I have been aware of putting people into categories there have been introverts and there have been extroverts. Some evaluations put me into the introvert class, and some put me into the extrovert class. I have never felt comfortable with either class. Now (as of this April) we have some internet articles about a new class of "ambiverts," and a new test to see if you are one (see below). Most of the questions on the test are subjective. Like most people, I like spending time in certain kinds of groups, but not others. Like most people, I enjoy spending time with my own thoughts when it is my choice to do so. There are times when I'm assertive, and times when I am not. It all depends on the circumstances. According to this test, I come out squarely on the ambivert side (I prefer the term "omnivert") because all of the MBTI criteria for introverts and extroverts seem to apply to me at one time or another. I imagine that I'm not alone. Given the choice of introvert, extrovert, and ambivert, it seems that most performing musicians are more likely to fit in the "ambivert" category. Perhaps it's because we seek out situations (some which are downright uncomfortable) where we can open ourselves up in front of strangers. Sometimes we draw energy from people, and sometimes we feel like they draw it from us. The research that fed the above Forbes article comes from a dissertation by Wharton School of Business graduate student Adam M. Grant that is based on the productivity of salespeople working in call centers. Perhaps, given the nature of this study, we shouldn't take the new classification that much to heart. There must be hundreds or thousands of different personality "types" that would fit into the Ambi or Omni variety (leaders vs. followers would be two of them). Culture, family, physical make-up, affluence, class, geography, education, interests, habits, and understanding social cues play a great part in the way each one of us feels around others. Now that I am exploring the world of Facebook, I have had a chance to really look at my past life as a flute player, because a good hunk of the people I used to know, know me as a flutist. When I started playing flute at 13 there were many really good flutists around, but I figured that because my mother could no longer play (due to a hand operation that, unbeknownst to her, put a pin in her thumb), I was simply taking her place. There was a bit of the "dutiful daughter" wrapped up into my otherwise rebellious early adolescence. I happened to begin playing the flute at a time when I was falling deeply in love with music, so I worked very hard and managed to get myself to the level of Juilliard acceptability in a couple of years. Let's say that I packed six or seven years' worth of practice into three. Back in the early 1970s in Boston there were not many people who played recorder seriously, and the idea of playing a one-keyed flauto traverso seemed unthinkable. The general mindset was that the modern flute could play all of that music with more projection, better intonation, and a lot more musical ease than its older ancestors. The music I liked best was really old music and really new music, so I never really connected with the bulk of the flute repertoire, even though I played it all. Thankfully for flutists, the flute repertoire has expanded immensely due to people who have contributed the IMSLP, and 40 years of composers who have written meaningful new music for the instrument. I decided not to get a Master's Degree at Juilliard because I thought it was immoral for someone like me, who had to struggle so hard to find work as a flutist (regardless of the quality of my playing), to try to make a living encouraging young flutists to pursue professional flutistry. I had a few good years of professional adventures as a flutist, and everywhere I went I found that there were far too many qualified flutists for the jobs that were available. I observed that getting work as a flutist anywhere would be a challenge that had more to do with luck, looks, and personal relationships than how well I played. I learned to play the recorder and the baroque flute, but finding a way to make any sort of living playing those instruments proved frustrating. The early music world was in its infancy, and the relatively small people who were able to play early music professionally had their handful of baroque flutists and recorder players, and they didn't need any more. When Michael and I moved to Illinois I soon discovered that all possibilities for modern flute playing were closed to me because all the flute positions in all the local orchestras were held by perfectly competent people, but I was eager to try to make some kind of a musical life as a baroque flute player. 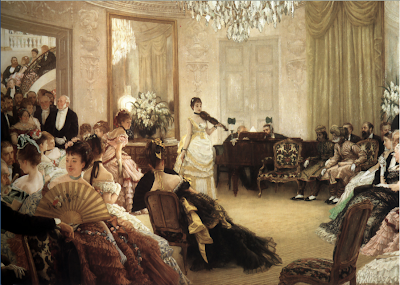 I was lucky enough to find three like-minded people to play with, and formed a triosonata group. We played concerts together for a few years, some of which were sponsored by the Illinois Arts Council. I did a lot of private teaching, and had a lot of success with my students, but when I applied to teach in the college music department, I was rejected (twice). I don't know why. Fortunately I found work as the classical music director for the college radio station, so I got to work with college students in what I thought was a healthier capacity than teaching them to become professional flutists. The rejection that I felt from the musical community in my town hurt me a great deal. My triosonata group fell apart, and I had nobody to play with. I tried to put all my musical energy into the radio station and into writing reviews, and I put my personal energy into our (very young) children. I baked bread. I sewed. I read. I considered homeschooling. I loved being with my children, but when I was alone I was miserable. I needed to play, but playing the flute was personally painful for me because playing the instrument brought up all sorts of feelings of foiled expectations. It's still difficult for me to play the flute without feeling like I'm about to cry, so it remains in the drawer most of the time. I didn't stop playing, but somehow I managed to get up the courage to begin playing the violin, an instrument I had "bombed out on" (my father's words) in the sixth grade. I bought a violin from one of my radio station students, and I began practicing. I didn't stop being a flutist, but nobody called me to play the flute for anything. Somehow it didn't matter much to me because had a new focus in my life, and I was determined to play the violin as well as I played the flute. I bought a viola at a yard sale in my neighborhood, and formed a string quartet with people who were really good players (every string quartet needs a violist), and now I live a pretty active musical life filled with chamber music, orchestral music, composition, teaching, and even Renaissance music. I'm writing this to share with the friends I knew when I was a flutist to let them know that I didn't abandon the instrument they love so dearly. In many ways it abandoned me. And I was lucky enough to find a piece of wood that could keep me afloat and bring me to a far healthier musical and personal place. I am by no means a biblical scholar, but I know for certain that the writers of Genesis knew nothing about middle-aged women (i.e. 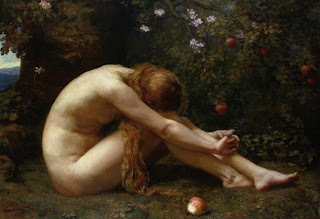 women who have achieved the age of wisdom that follows the child-bearing years), or they would have indicated that Eve's real punishment for having eaten the apple when she was young was to have hot flashes. This punishment is compounded by observations I have made (in my laboratory on the right side of the sofa): drinking a glass of wine before going to bed increases the chance that I will have a hot flash before falling asleep, and having hot tea (which I like to drink by the pot) is a sure-fire (oy, that pun just came out) trigger for a hot flash. For readers who are male, just imagine having eight or nine (or more) panic attacks every day that cause your heart to beat very quickly, and cause you to sweat profusely for indeterminate amounts of time at random intervals for no reason whatsoever (aside from your age and the chemical components of your gender). I think that the above image does justice to the experience of having a hot flash, but minus the apple. Our friend Jim Koper, who is a rocket scientist by day (really) and and a truffle maker by night, encouraged his friend Amy Singh pursue her deep desire to make chocolate in her own kitchen. He also took photographs to document the process, and is responsible for the video and the slides that go with her TED talk. Our son Ben, who was a state speech champion in high school, helped Amy edit her talk. 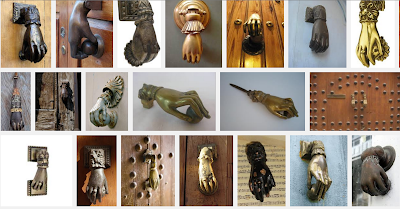 Until I made yesterday's post about door-knocking customs in England, I had never seen a hand-shaped door knocker. It seems that they are all over Prague, Malta, and even Barcelona. The hand could symbolize the Hand of Fatima of the hand of Miriam, depending on whether you were Muslim or Jewish (Fatima was the daughter of Mohammed, and Miriam was the sister of Moses). It was there to protect the house and ward of evil spirits. Perhaps the ring that you see on the ring finger of many of these door knockers is a "cultivated" representation of the eye that is so often in the center of the Hamsa Hand or Hamesh Hand. There was a custom of having different knockers with different sounds for men and for women in Islamic countries so that Islamic women, who were forbidden to open a door to a man, could know if their visitor was a man or a woman. I guess it was kind of like a ringtone! This was the period of iron and brass knockers, the street door of every house being furnished with one. 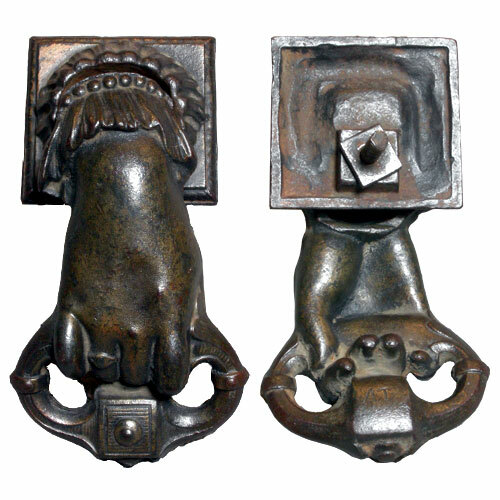 Even these knockers were made to register "class distinctions." For instance, there was one knock for those who came on business of a humble nature, two for the postman, three or four for professional visitors, while for social calls from the upper classes from five to eight knocks were customary; this was called by the name of "a double knock" and was often followed by a lusty peal of the door-bell, which generally indicated that there was a carriage and a pair at the door. Perhaps the reason for the title of the movie (and the novel from whence it came) has something to do with knowing who it is knocking on the door, or what is simply bound to happen.
. . . My secret desire was to write a piece of music. 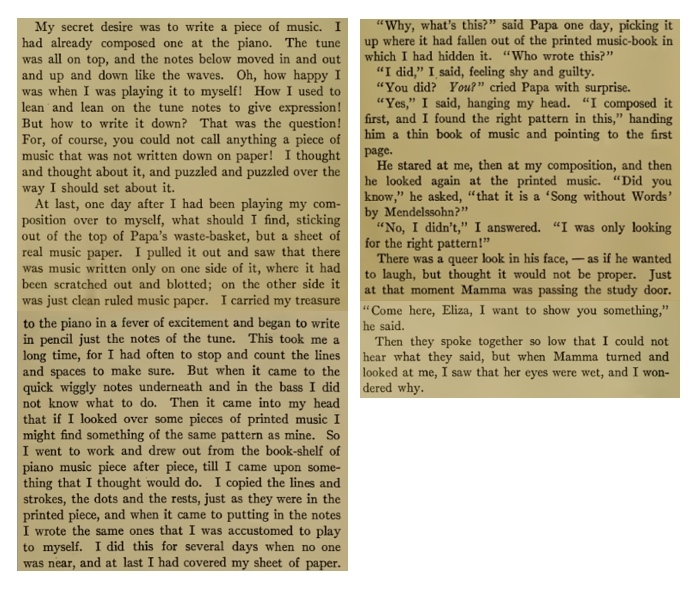 Here's an excerpt from Clara Kathleen Rogers' Memories of a Musical Life. I find the stories she tell about her childhood in 19th-century England beautiful and compelling. 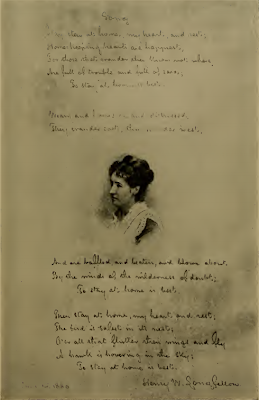 Clara Kathleen Rogers (1844-1931) had a remarkable career as a singer, a teacher, a composer, and as a writer. Her father, a cousin of Meyerbeer, was an opera composer, and her maternal grandfather was the great English cellist Robert Lindly. She studied at the Leipzig Conservatory, toured as a singer under the name of Clara Doria, and settled in Boston where she married a Lawyer and stopped performing. 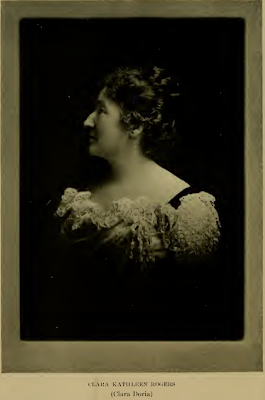 As a married woman she devoted her time to composing and teaching, and in 1919 she wrote about her remarkable life (with observations galore about Liszt, Ferdinand David, Von Bulow, Moscheles, and a whole slew of other fiddle players, pianists, and singers). 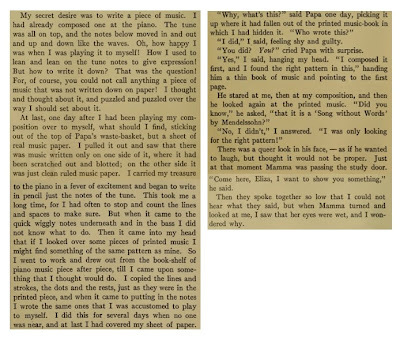 Her Memories of a Musical Career is available to download as a PDF through the Internet Archive. The memoir ends with her marriage, which was when her life as a composer really began. This link will take you directly to it if you are a member. If you're not a member, you should join and look around. I came of age when Abstract Expressionist artists like Robert Motherwell were considered "modern" artists. 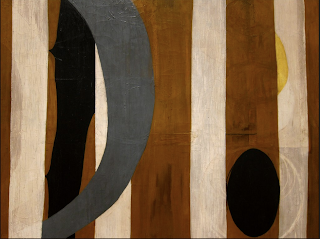 Their work appeared fresh and new when I began looking at it in the 1970s (it was actually a generation old already). 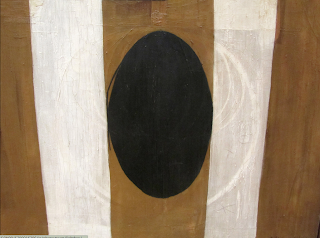 The room that holds the Abstract Expressionist collection at the Art Institute in Chicago is open and airy, and the light makes it extremely easy to really look at the details in the paintings there. Now that "Wall Image with Stripes" (painted in 1944) is 69 years old, its surface is beginning to show signs of age. 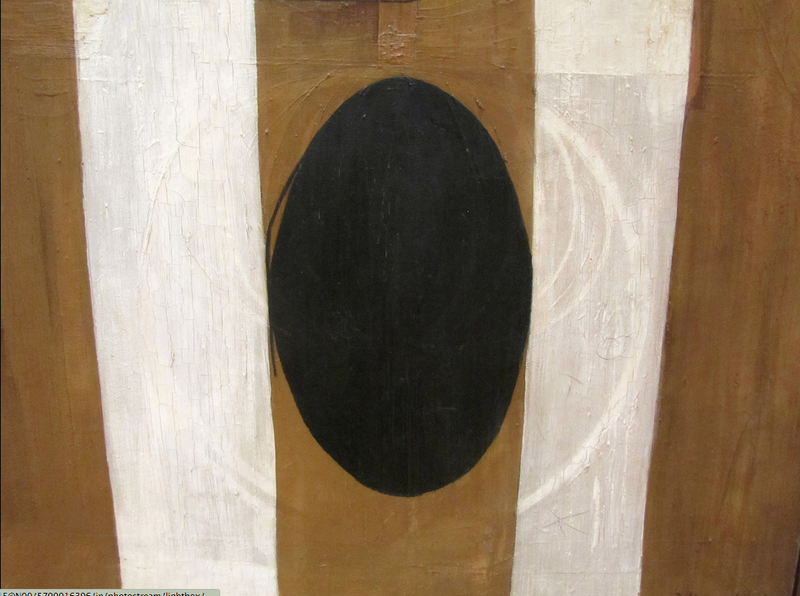 Is the way the surface of the painting looks now the way Motherwell would have imagined it to look when it reached its 70th year? He did paint "distress" into the painting, but not this particular crazed kind of distress. Would he have if he could? It is an oil painting on canvas, but it looks like it could have been made with barn paint on wood, at this point. I wonder, even under the ideal conditions of its home in Chicago, if its surface will continue to deteriorate. And I also wonder if, like a person who has aged, we are to consider its beauty the beauty that is present at each encounter. Would a restoration ruin the integrity of the painting? Would it be ethical to restore it? We consider pieces of art to be permanent, but do artists consider their pieces of art to improve with age the way stringed instruments improve with age? Meet my new favorite 19th-century painter! You can see his complete works here, and you can see many of his paintings in the "flesh" at the Art Institute in Chicago. They are part of a special exhibit about the clothes that people wore in many of the best known (and some of the least known) works of the 1860s through the 1880s in France.